[S893] Wiley Alston Jarrell, electronic mail to e-mail address, 15 Oct 2001, attributing information to family group sheet supplied by Samuel Lamar Samuel on 9 Apr 1995 (naming Willis Major Jarrell as his father). [S893] Wiley Alston Jarrell, electronic mail to e-mail address, 15 Oct 2001, attributing information to family group sheet supplied by Samuel Lamar Samuel on 9 Apr 1995 (naming Ann Eliza ['Annie'] almond as his mother). [S893] Wiley Alston Jarrell, electronic mail to e-mail address, 15 Oct 2001, attributing information to family group sheet supplied by Samuel Lamar Samuel on 9 Apr 1995. [S893] Wiley Alston Jarrell, electronic mail to e-mail address, 15 Oct 2001, attributing information to family group sheet supplied by Samuel Lamar Samuel on 9 Apr 1995 (naming Willis Major Jarrell as her father). [S893] Wiley Alston Jarrell, electronic mail to e-mail address, 15 Oct 2001, attributing information to family group sheet supplied by Samuel Lamar Samuel on 9 Apr 1995 (naming Ann Eliza ['Annie'] almond as her mother). [S893] Wiley Alston Jarrell, electronic mail to e-mail address, 15 Oct 2001, attributing information to family group sheet supplied by Samuel Lamar Samuel on 9 Apr 1995 (giving the year and state). [S1175] Wiley Alston Jarrell, electronic mail to e-mail address, 16 Feb 2008. [S1029] Wiley Alston Jarrell, electronic mail to e-mail address, 22 Jul 2005. [S1029] Wiley Alston Jarrell, electronic mail to e-mail address, 22 Jul 2005, attributing information to family group sheet supplied by Samuel Lamar Samuel on 9 Apr 1995 (naming Walter Harris Jarrell as his father). [S1029] Wiley Alston Jarrell, electronic mail to e-mail address, 22 Jul 2005, attributing information to family group sheet supplied by Samuel Lamar Samuel on 9 Apr 1995 (naming Walter Harris Jarrell as her father). [S1029] Wiley Alston Jarrell, electronic mail to e-mail address, 22 Jul 2005, attributing information to family group sheet supplied by Samuel Lamar Samuel on 9 Apr 1995 (naming Larkin Randolph Lay as her father). [S1029] Wiley Alston Jarrell, electronic mail to e-mail address, 22 Jul 2005, attributing information to family group sheet supplied by Samuel Lamar Samuel on 9 Apr 1995 (naming Margret [sic] Jane Garrett as her mother). [S893] Wiley Alston Jarrell, electronic mail to e-mail address, 15 Oct 2001, attributing information to family group sheet supplied by Samuel Lamar Samuel on 9 Apr 1995 (giving the date but not the place). [S1029] Wiley Alston Jarrell, electronic mail to e-mail address, 22 Jul 2005, attributing information to family group sheet supplied by Samuel Lamar Samuel on 9 Apr 1995. [S1029] Wiley Alston Jarrell, electronic mail to e-mail address, 22 Jul 2005, attributing information to family group sheet supplied by Samuel Lamar Samuel on 9 Apr 1995 (naming Kate Ferguson Lay as his mother). [S1029] Wiley Alston Jarrell, electronic mail to e-mail address, 22 Jul 2005, attributing information to family group sheet supplied by Samuel Lamar Samuel on 9 Apr 1995 (naming Kate Ferguson Lay as her mother). [S894] Tate/Tait family bible, located in Elbert County, Georgia, online http://www.obcgs.com/tate.html, downloaded 14 Dec 2003. [S894] Tate/Tait family bible, located in Elbert County, Georgia, online http://www.obcgs.com/tate.html, downloaded 14 Dec 2003 (naming Edmond Brewer Tate as her father). [S894] Tate/Tait family bible, online, above (naming Mahaleth Fortson as her mother). [S894] Tate/Tait family bible, online, above (giving the date but not naming the place). [S894] Tate/Tait family bible, online, above. [S894] Tate/Tait family bible, located in Elbert County, Georgia, online http://www.obcgs.com/tate.html, downloaded 14 Dec 2003 (naming Edmond Brewer Tate as his father). [S894] Tate/Tait family bible, online, above (naming Mahaleth Fortson as his mother). [S894] Tate/Tait family bible, online, above (naming Ella Gertrude Mathews as his mother). [S894] Tate/Tait family bible, located in Elbert County, Georgia, online http://www.obcgs.com/tate.html, downloaded 14 Dec 2003 (naming Edmond Brewer Tate, Jr. as his father). [S894] Tate/Tait family bible, online, above (naming Ora Eugene Tate as his father). [S894] Tate/Tait family bible, online, above (naming Ora Eugene Tate as her father). [S894] Tate/Tait family bible, online, above (naming Carrie May Hudson as his mother). [S894] Tate/Tait family bible, online, above (naming Carrie May Hudson as her mother). [S894] Tate/Tait family bible, located in Elbert County, Georgia, online http://www.obcgs.com/tate.html, downloaded 14 Dec 2003 (naming Ora Eugene Tate as her father). [S894] Tate/Tait family bible, located in Elbert County, Georgia, online http://www.obcgs.com/tate.html, downloaded 14 Dec 2003 (naming Ora Eugene Tate as his father). [S312] Social Security Death Index, online at http://tinyurl.com/AncestrySSDI, viewed on 14 Dec 2003. [S312] Social Security Death Index, online at http://tinyurl.com/AncestrySSDI, viewed on 14 Dec 2003 (stating that he died in Apr 1972; not naming the place of death but stating that he lived in Elberton, Ga. when he died). [S312] Social Security Death Index, online at http://tinyurl.com/AncestrySSDI, viewed on 14 Dec 2003 (stating that he died in Apr 1966; not naming the place of death but stating that he lived in Elberton, Ga. when he died). [S312] Social Security Death Index, online at http://tinyurl.com/AncestrySSDI, viewed on 14 Dec 2003 (stating that he died in Apr 1966; not naming the place of death but stating that he lived in Orlando, Fla. when he died). [S312] Social Security Death Index, online at http://tinyurl.com/AncestrySSDI, viewed on 14 Dec 2003 (stating that she died on 21 May 1991; not naming the place of death but stating that she lived in Elberton, Ga. when she died). [S312] Social Security Death Index, online at http://tinyurl.com/AncestrySSDI, viewed on 14 Dec 2003 (stating that he died in Jun 1984; not naming the place of death but stating that he lived in Lawrenceville, Ga. when he died and that last benefits were sent to an address in Atlanta, Ga.). 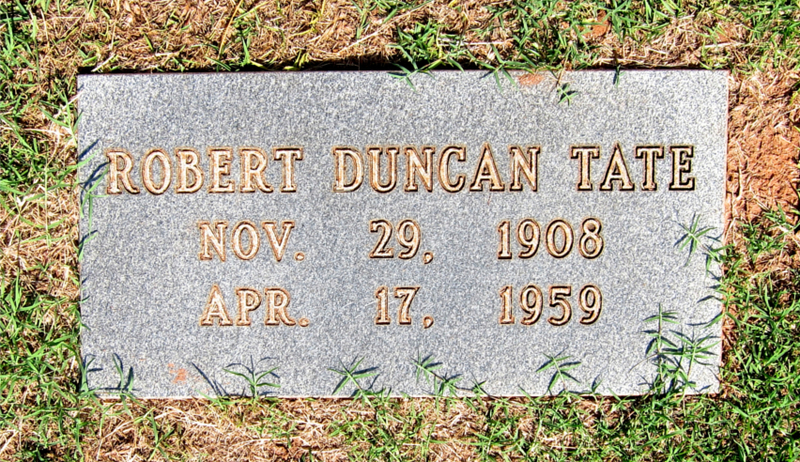 Robert Duncan Tate's tombstone, Elmhurst Cemetery, Elberton, Ga., courtesy of "texnative" on www.findagrave.com. Other Names*: R. Duncan Tate. [S961] Find A Grave, online at http://www.findagrave.com, memorial for Robert Duncan Tate, memorial no. 44207677, viewed on 5 June 2016. [S312] Social Security Death Index, online at http://tinyurl.com/AncestrySSDI, viewed on 14 Dec 2003 (giving the month and year). [S27] John Wright Boyd, A Family History: Lt. Thomas Fortson, etc., above, p. 695 (naming R. Duncan Tate as her father). [S961] Find A Grave, online, above, memorial for Alice Tate Butler, memorial no. 147274124, viewed on 5 June 2016 (naming Robert Duncan Tate as her father). [S961] Find A Grave, online, above, memorial for Robert Duncan Tate, memorial no. 44207677, viewed on 5 June 2016 (naming Robert Duncan Tate as her father). Mary Frances Almond Tate's tombstone, Elmhurst Cemetery, Elberton, Ga., courtesy of "texnative" on www.findagrave.com. Other Names*: Mary Frances Almond Tate, Mary Almond Tate, Mary Frances Tate, Mary Tate. [S27] John Wright Boyd, A Family History: Lt. Thomas Fortson (1742-1824) and Some of His Descendants—Early Settler of Elbert County, Georgia (Danielsville, Ga.: Heritage Papers, 1973), p. 695 (naming George Milton Almond as her father). 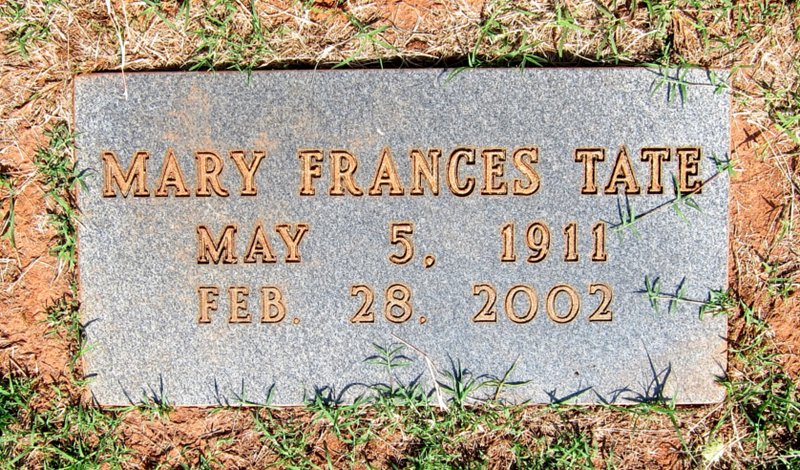 [S961] Find A Grave, online at http://www.findagrave.com, memorial for Mary Frances Tate, memorial no. 44207670, viewed on 5 June 2016. [S27] John Wright Boyd, A Family History: Lt. Thomas Fortson, etc., above, p. 695 (naming Mary Frances Almond as her mother). [S961] Find A Grave, online, above, memorial for Alice Tate Butler, memorial no. 147274124, viewed on 5 June 2016 (naming Mary Frances Tate as her mother). [S961] Find A Grave, online, above, memorial for Mary Frances Tate, memorial no. 44207670, viewed on 5 June 2016 (naming Mary Frances Tate as her mother). [S312] Social Security Death Index, online at http://tinyurl.com/AncestrySSDI, viewed on 14 Dec 2003 (stating that she died on 10 Sep 1998; not naming the place of death but stating that she lived in Elberton, Ga. when she died). [S312] Social Security Death Index, online at http://tinyurl.com/AncestrySSDI, viewed on 14 Dec 2003 (stating that he died in Sep 1978; not naming the place of death but stating that he lived in Elberton, Ga. when he died and that last benefits were sent to an address in Elberton, Ga.). [S312] Social Security Death Index, online at http://tinyurl.com/AncestrySSDI, viewed on 14 Dec 2003 (stating that he died on 15 Mar 1994; not naming the place of death but stating that he lived in Elberton, Ga. when he died).